Adara is the Redguard daughter of Kerah and Endon, who are silversmiths in Markarth. Her brother is Cade, who is off fighting with the Stormcloaks. When she grows up, she wants to be a silversmith like her parents; for now, she is apprenticed to her father. If anything befalls her mother, she technically takes over running Kerah's jewelry stall as well, standing behind it during business hours and attempting to attract customers. However, she does not offer you any merchant dialogue, making it impossible to trade with her. Her father is essential, so she cannot become an orphan. She wakes at 8am and goes outside with her father, following him around. They can be found wandering the streets of Markarth until 8pm, when they and Kerah head to Silver-Blood Inn to dine for three hours and converse with each other. They return home at 11pm, when Adara goes to bed. Adara wears child's clothes and a pair of shoes. She carries a key to the family's house, a key to her mother's jewelry case, a selection of food and toys, and a small amount of gold. 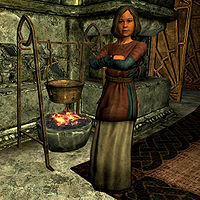 Adara seems to admire her parents and will tell you about her dream of becoming a silversmith: "I'm going to be a silversmith one day, like my mother and father." She will also tell you about her current work as an apprentice: "Being an apprentice is great. I get to swing a hammer at things." She seems to be a very energetic child, as she may tell you: "Mama doesn't like me jumping up and down in the house, but I can't help it. I swear." When she is running Kerah's stall, she can be heard saying things like "Jewelry for sale. Redguard craftsmanship in every piece. ", "You there, uh, the finest silver in Markarth is sold right here. ", and "Maybe you could buy a gift for a friend? A best friend?" If you talk to Adara's father, Endon, he may mention her: "My daughter Adara is also my apprentice. She's a quick study." Kerah may also do the same: "My daughter Adara is going to be a fine silversmith when she's older." When conversing, Endon can be found praising their daughter, telling Kerah, "Adara bends the silver so naturally. Grandmother would have cried if she saw how deft our daughter has become." and "Yes, I have. Adara made the rings herself. She is learning to bend the metal well." Kerah: "What should we have tonight?" Endon: "Something simple, a stew perhaps." Adara: "Stew again, papa? I want steak." Kerah: "Maybe we could spend a little bit more and buy some meat, Endon." Endon: "May be. Let me think about it." Adara: "Mama, when is Cade coming home?" Kerah: "He's off fighting, Adara, with the Stormcloaks. He'll return when the war is over." Endon: "Our son joining the Stormcloaks. If this war had never happened, Cade would have joined the Imperial Legion, like grandfather." Kerah: "Endon, we talked about this... Are you still disappointed in Cade's choice?" Endon: "No. I think if I was a young man, I would have done the same." Adara: "Can I join the Legion when I grow up?" Endon: "If there's still a Legion left, Adara. I'm sure you'd make a great soldier. Just like your brother." Kerah: "We sold all those lovely little necklaces you brought me today. Did you make them yourself?" Adara: "That's right! Papa helped me with the clasps, but I did all the links on my own." Endon: "Adara bends the silver so naturally. Grandmother would have cried if she saw how deft our daughter has become." Kerah: "Well, I'm proud of both of you. I haven't been so busy since those nobles from Solitude come into the city three years ago." Endon: "I miss those days, before the Forsworn took up arms again, when you could walk the roads in peace." Kerah: "Endon, dear, please don't.... Save your frustrations for work." Endon: "You're right, dear. I'm sorry to worry you." This page was last modified on 26 August 2018, at 23:21.